Hewlett Packard Enterprise Co. shares slumped the most in more than a year after posting earnings forecasts that left analysts less than impressed. Profit excluding certain costs will be 35 cents to 39 cents a share in the fiscal third quarter, the Palo Alto, California-based company said in a statement Tuesday. Analysts had projected 36 cents on average, according to data compiled by Bloomberg. 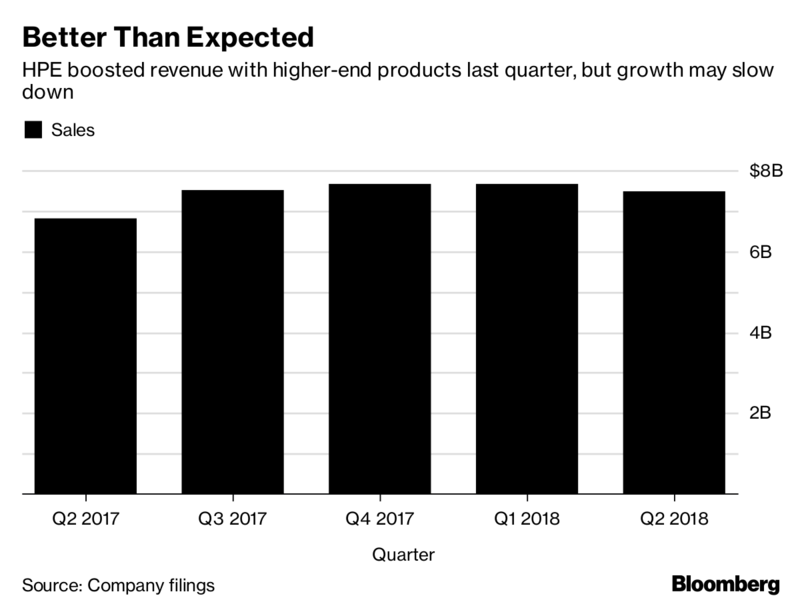 HPE Chief Executive Officer Antonio Neri said growth rates will “modulate” later this year on tough comparisons. Shares slumped as much as 10 percent Wednesday, the most intraday since February 2017. The stock was down 9.9 percent to $15.70 at 11:00 a.m. in New York. The second half of 2018 is “the real test,” said George Iwanyc, an analyst at Oppenheimer & Co. A sustained improvement could show investors that progress in the first half wasn’t only due to easy comparisons and favorable currency exchange. HPE’s forecast wasn’t encouraging enough right before the company is about to move into the seasonally weaker July quarter, said Pivotal Research Group analyst Lou Miscioscia. And while second-quarter results were good, it was less of a beat than the first quarter, he said. Neri has sought to diversify the hardware maker from the servers and storage solutions that generate most of its revenue. He’s tried to reshape the company into a hybrid-cloud and networking player by developing offerings for the internet-of-things and boosting its software products. A Dell spokeswoman pointed to recent remarks from executive Jeff Clarke that Dell has the largest market share in servers and storage and expects to increase its lead this year.